I've been practicing my stamping! Stamping is something I've had to practice but I'm getting better everyday. Nail Polish Canada was nice enough to sent me a Konad m93 stamping plate. This plate has a small anchor stamp, a full nail checkerboard pattern, full leopard print, full 3D cubes and a full heart pattern. 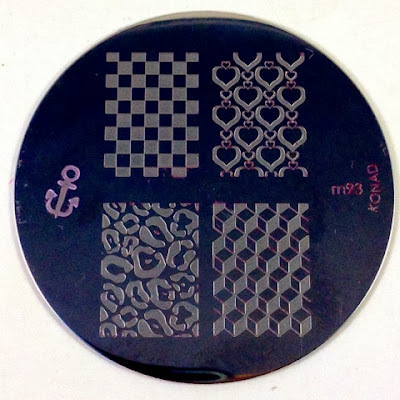 I found this plate was easy to use and the polish sunk into the designs very well. The stamps transferred beautifully to the nail. For my first design I created a red, white and blue chevron design accented with the anchor stamp on the ring finger. I used Essence Walk on Air, OPI Alpine Snow and Essie Forever Yummy. For another look I used a base of Butter London Dodgy Barnett. Over the top I used Finger Paints Ch-art-coal Black for the stamping of the checkerboard pattern. My nails are a little long for my stamper which is why the design curved a bit towards the bottom. 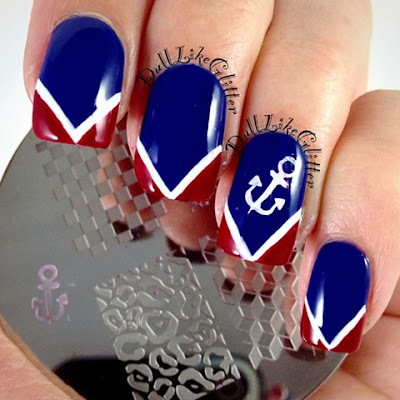 I need to invest in an XL stamper so I can find my long nails with these gorgeous stamps. Konad is known as the cream of the stamping crop so head over to Nail Polish Canada and check out their stamping section! They have everything from plates to stamping sets to stamping polishes. Lucky for you, if you're Canadian, they are having a giveaway right now! Just head here and enter to win five Konad stamping plates.